There are a number of different objects in this optical illusion including a table, a pair of shoes, a folding deck chair and a bottle of wine. All these items have been strategically put in place so that when you look at the image it casts a shadow on the wall behind them. 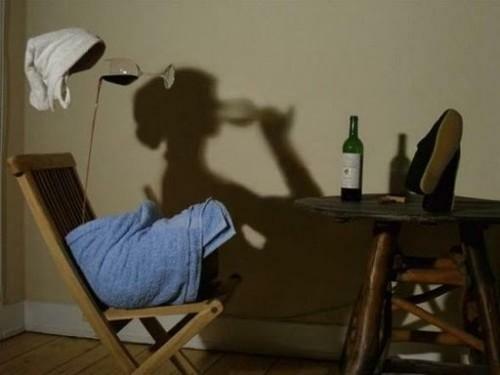 The shadow gives the appearance of a woman reclining in her chair and sitting with her feet up on the table while holding a glass of wine up to her mouth. Sorry, i must be stupid cause i don't understand it. What makes the shadow of the head? The body and the arm? Really don't get it. If you pass by here, could you explain it to me please?...Thanks.